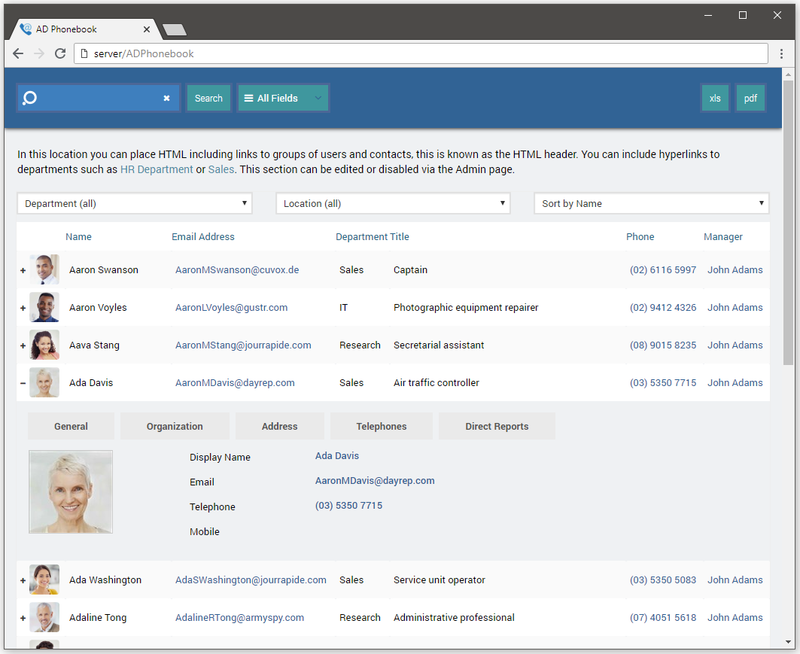 AD Phonebook takes the pain out of maintaining the company directory, it’s browser-based so can be accessed from mobile and desktop devices. The phone book data is read from Active Directory so it is always up to date, no out of date spreadsheets or printouts, no need to manually maintain a web page. When you update the details for a user (or contact) in Active Directory the phone book is automatically updated. Why not allow your users to update their own contact details and correct error by using AD Self Update. As it is based around Active Directory it is easily updated, when employee details are updated in Active Directory they’re updated in the phone book providing your users with the latest contact information. What is shown is based on your criteria, only users or contacts that you want to appear are listed. You can display attributes such as car parking space, employee number, manager etc. Installation is easy and you can be up and running in minutes. You can customize the look and what data is shown to your users, you can enable exporting of the phone book to pdf or excel so a paper copy is still available if needed. No need to manually maintain your staff directory. No more out of date phone books. Syncs with Active Directory, supports multiple domains. Browser-based works with all browsers, desktop and mobile. Customize what is shown, telephone, mobile, email, department, car park space etc. Exclude users, groups, OUs that you don’t want to appear. Only display attributes you need, custom attributes are also supported. Users can update their own contact information when used with AD Self Update. Your company name and logo can be added to the title bar, all the colors and text can be changed to suit your identity. More detailed information is shown when an entry is clicked, you can display values from almost any Active Directory attribute (extensionAttribute1, description, employeeID etc). Email address and phone numbers can be hyperlinks. You can use our photo import tool AD Photos to import photos into Active Directory in bulk (includes watermarking feature). Search the phonebook based on the properties you specify. Allow your users to export the phonebook to PDF, Excel, Word or CSV (or turn this feature off). Customize AD Phonebook to display the information you want your users to see. AD Phonebook supports multiple domains. When more than one domain is available you can query all domains (default) or query specific domains. Domain names can be changed to show a friendly name (London, New York, Staff etc). How long does it take to install the trial? You can download a trial below, it takes 5 minutes to install and test on a Windows Server with IIS installed and ASP.NET 4 or higher enabled.